I've seen the word "utility" used to describe clothing as early as 1898, but the term gets its last big hurrah during World War II, particularly in Britain, where utility clothing was endorsed by the government. I suspect the whole idea of utility clothing carried such emotionally difficult connotations by the time the war was over that nobody ever wanted to hear the term again, and I don't think anybody has. 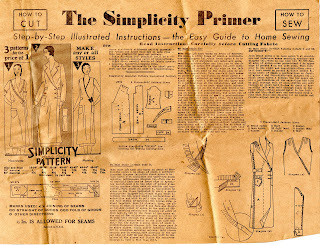 Three distinctly different utility garments for 'round the house wear may be made from this one SIMPLICITY hand cut pattern. Style #1 With its feminine frill is a dainty, useful morning apron or house-frock. Style #2 A careful choice of fabrics creates a mannish, tailored, lounging robe. Style #3 The Hooverette is the ideal garment for the practical side of housekeeping. I wish I lived in times past when ladies wore house-frocks... sigh. I'm just old enough to remember my mother putting on a hat and gloves when going shopping downtown, and she remembers her mother always changing into an afternoon dress after having finished the morning's housework and had lunch. One of the few good things about the present age is that there is so much room for personal expression that probably nobody will think twice if you sally out in a hat and gloves with shoes and handbags to match. I wish I could get hold of that robe pattern - VERY wearable, both as a dressing gown (how nice not to have a tie that makes you look like a sack of potatoes) and as a dress. This looks very much like Diana von Furstenberg's wrap dresses - possibly what she based them on? Fascinating social history - I love your blog! Keep 'em coming. It's not so surprising that these dresses were not meant to be worn outside of the house (or backyard, or porch, which is why you sometimes see them referred to as "porch" dresses). Nearly everything a middle-class home needed was brought to the door; Tony the fruit and vegetable man (in the 1960's in suburban Detroit we still had a Tony), Mike from the wetwash laundry picked up and delivered, even the drugstore and the grocery store had a teenaged boy on a bike who rode over with your phoned-in order. Serious shopping at the department stores downtown mean hat, gloves, stockings, and a suit or tailored dress. And of course a stop at the ladies' tearooms for sustenance before catching the streetcar home. That's a good point about services coming to the home. And remember alleys where the deliveries were made? 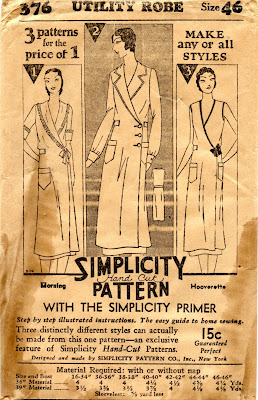 There are a couple of late '20s McCall patterns for porch dresses that I covet, and I have a 1914 issue of Priscilla Magazine that has a pattern for porch sweater that I've got on my life list of things to knit. I actually really like this one & I am entranced by the idea of a housedress. I've been toying with the idea of making myself one for the longest time. I find it so hard to be motivated to clean, fold, etc. in my usual uniform of schlumpy jeans & a T shirt!